"Hell has finally frozen over ... It's the 1.10 patch !" The development of the AfterMoon project continue and a new step was reached with the first test of the GameLaunchPad. The GameLaunchPad is an auto-update tool, and if you have ever played a MMOG you know why it is really needed. Take a look here for more info. The 0.4 release of COOP or DIE with KMQuake2 inside is out. You can grab it on the download page. Feel free to post any feedback related to this version here. The last COOP or DIE champion is named Szyszka and come from Polend. He has beaten the entire classic Quake2 game with 1 life ! Knighmare has released the version 016 of his KMQuake2 engine. Read this and be prepared for a new release of COOP or DIE very soon. During this summer the development of COOP or DIE has progressed slowly. I have also taken a look to the 3D application Blender and started to write an import/export script for Quake2 MD2 models. Psychospaz has released a new version of his Quake2 engine Quake2Max. But the most important information for the future of my projects is the Lazarus GPL confirmation by David Hyde, and the Knightmare work on his KMQuake2 engine/dll modification. KMQuake2 is an eyecandy Quake2 engine with a modified dll that has Lazarus , CTF and ACE bot all merged. My choose is 90% done and the next release of COOP or DIE will probably be based on KMQuake2 "engine + dll". There is a new COOP or DIE champion named Onion who has beaten the entire classic Quake2 game with 1 life ! The COOP or DIE players community is currently under an invasion from Poland and more precisely from q2.anomal.org. I want to say "welcome" to all these Polish, it is always a pleasure for me to see players from all around the world. The new inventory dataset management system for COOP or DIE is now available since 5 days. The are also some news teleporters in the StartMap, one for the good old "punishment" map, and one for the Stench serie. I also want to excuse me for all the news players since the 5 last days who have attempted to register an account on the COOP or DIE website, there was a bug in the register form, but it is now corrected. The limit of 600 registered accounts for COOP or DIE has beeen reached today ... Cool ! But all the data stay stored in the database (name, map, coordinate and cause of death). This will be a precious statistic for the mappers of future new missions. The 0.3b release of COOP or DIE is out. You can grab it on the download page. This is an intermediate release with some bug fix and little enhancement. The size limit for XmlRules files has been increased, so now secrets missions created by Crusard can be supported. There are also some little new enhancement like the persistance of death body. The new teleporters for additionnal missions will be added laters, but it will be a worldserver side patch, no download needed, you will see them soon. 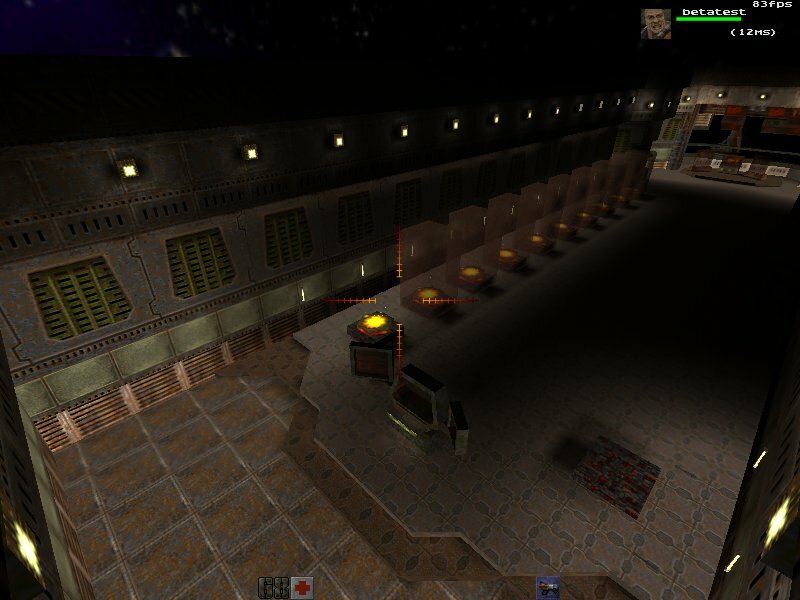 I can already announce that the next release will have support for the stench serie, a recent PlanetQuake map of the week, from The Huge harddrive. I will also work for a french team who develop a promising standalone game using QFusion. I will integrate a WorldServer in their game. I also want to congratulate MONOMARIO who have recently beaten the entire Quake2 game in challenge mode, like he said himself : "YEAAH !!! CHILE RULZ ! " Some new monsters have been added to the "Outer base" and the "Installation" maps of the first mission. Thanks to JudicatorOmega who have created the additionnal XmlRules files. I have added a statistic page on COOP or DIE, and begin to work on the schedule. The screenshot page has been updated. Today I've realeased a small modification of the Quake2 engine with a fix for the WSAECONNRESET bug under MS-Windows XP. In addition, the ping of servers is displayed in the "multiplayer / join" menu. You can download the binary here, and have the source of the bug fix here. The first release of XmlRulesTool is available, read more about it in the forum. There is more than 170 gamers who have played on the WorldServer during the last 15 days. It's a really enjoyment, and it will probably change a little my plans for the futur. The WAR AGAINST THE CYBORGS project will start later. I will continue to enhance COOP or DIE and particulary work on extensions like new missions and new monsters on existing maps. There is now one week since COOP or DIE was declared Mod of the week on PlanetQuake. There is more than 300 players who have registed an account. Every day, at every hour, some cool cooperative party are played on the WorldServer. Four peoples have already beaten the entire game and slayed makron without dying ! I have started to add monsters and modify items repartition for a challenging gameplay. Some mappers have started to work on new missions pack for COOP or DIE, and there is also some new secret maps under preparation. The source code of the 0.3a WorldServer version is now available on the download page. The 0.3a version of the WorldServer is available again, a bug has been corrected. It wasn't a "end of unit" bug like I primary think, but a Quake2 bug about cooperative mode and saved game (occur when you return to a previously visited map). I will probably post something about this subject in the QuakeSrc forum. The 0.3a version of the WorldServer for COOP or DIE with the Challenge Mode and the new StartMap is available on the download page. The source code will be available very soon, I only need to finish some readme and changelog files. He he he, today by inspecting the referers in the statistics of my website I've discover a secret website. It's a very interesting one, and it make me very happy. But I'm sorry, actually, the only thing I can tell you is it's WorldServer related, and it's very promising. I've just finished the single player campaign of CodeRed today. And the only thing I can tell you is : GO GO GO, download and play this game. It is a very good game based on the Quake2 engine, and it is a standalone package : you don't need Quake2 for playing it ! The betatest of the the Challenge Mode is near completion. The new PreGame and StartMap maps are also OK.
so approximatively one error every 20 minutes !! Some of these errors are due to an internal bug that will be corrected with the next version. A lot of others errors could probably be removed with a better retry system. I will enhance this before the next release. The first draft of the Challenge Mode will probably be available during the next week-end. You can see here a screenshot of the new startmap. Teleporters for each mission will be available step by step, after goals been reached.